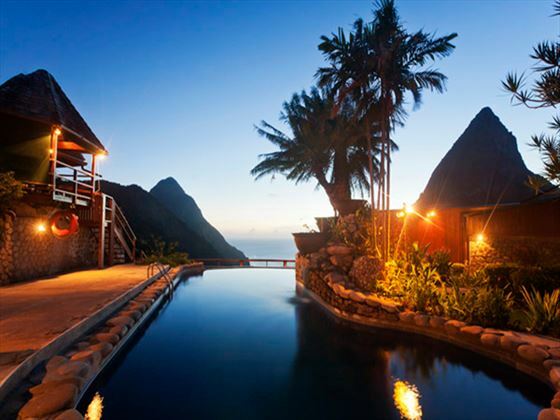 Sitting proudly at the heart of the gorgeous mountains on St Lucia’s south coast, Ladera Resort & Spa is an adult-only property offering luxurious suites and awe-inspiring views. We find the main enticement for this wonderful retreat is that it’s the only resort to be nestled within a UNESCO World Heritage Site, adding a unique and exciting edge to an already beautiful oasis. The views here will never fail to take our breath away. 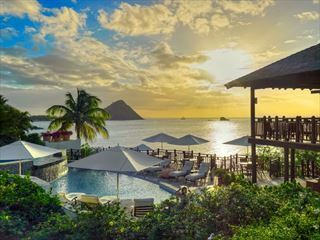 The jewelled Pitons stand impressively amongst the sparkling Caribbean Sea, offering a truly indulgent backdrop, whilst the resort itself sits along a volcano ridgeline raised 1,000 feet above the ocean’s edge. You’ll never bore of the stunning sights. 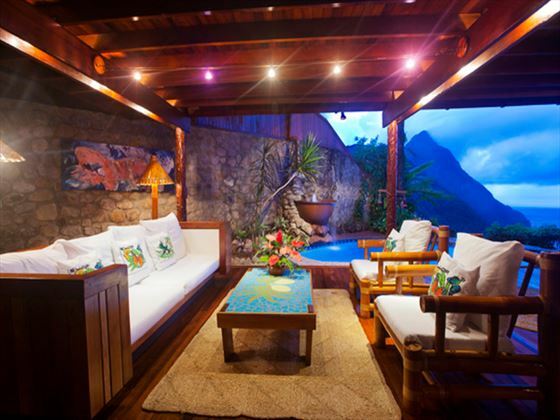 Every room comes with either a plunge pool or a heated pool, and the romantic atmosphere and intimate setting make it the perfect choice if you’re looking for a little time away with your partner in a truly world-class location. 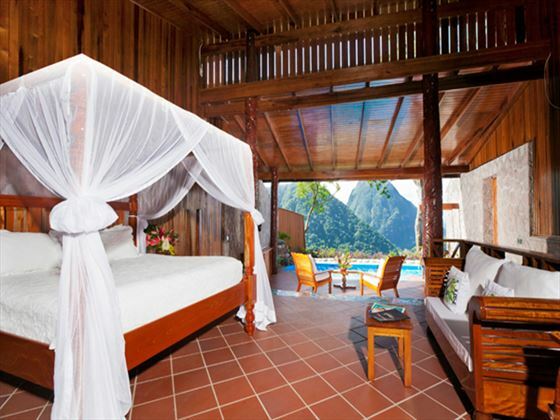 The classic dark woods and Caribbean décor offset the stunning azure blue of the ocean and emerald green Pitons. Enjoy gourmet dishes as you look out onto breath-taking vistas or pamper yourself with a relaxing facial or a massage at the spa. The infinity pool is a tranquil spot to take in the sunset or if you’re looking for something a little livelier, there’s live evening entertainment each day. 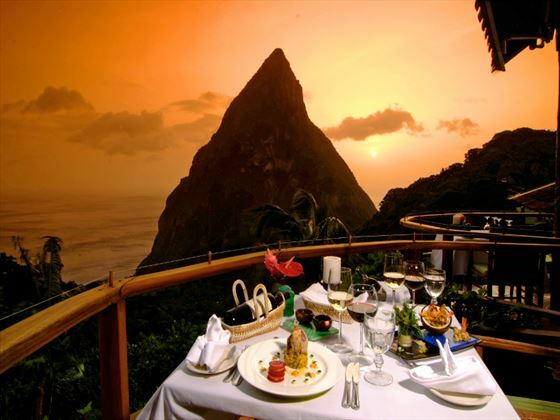 Further reading: Ladera Resort & Spa is featured in our guide to the top 10 honeymoon hotels in St Lucia and top 10 boutique hotels in St Lucia. 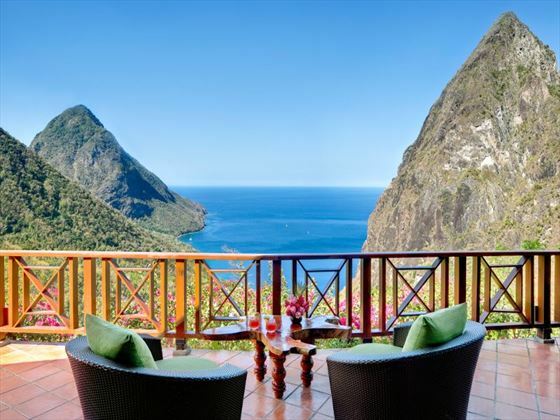 Overlooking the gorgeous Pitons and the Caribbean Sea below, Ladera offers one of the most spectacular locations in the whole of the Caribbean. 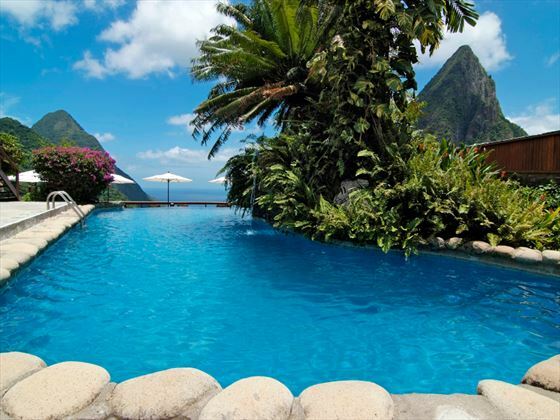 Sitting in tranquil seclusion just outside of St Lucia’s former capital, Soufriere, you have all the peace and quiet you need for a relaxed holiday but also every modern convenience in easy reach. 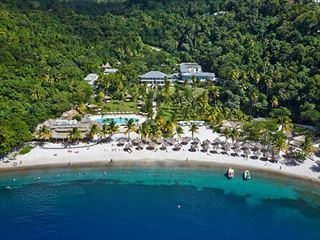 Based on a stunning plateau high in the mountains, Ladera does not have a beach directly on its doorstep; however the resort offers a complimentary shuttle bus to the fine white sand at Sugar Beach at the foot of the Pitons – around a ten minute drive away. 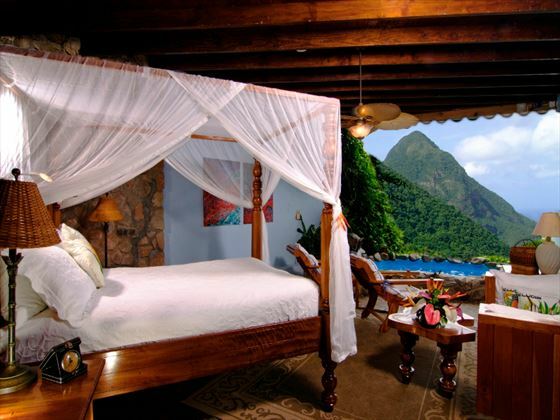 Gros Piton Suite with plunge pool – offering wonderful views of the Pitons and the Caribbean Sea, these suites offer a queen-size bed, en-suite shower and non-heated plunge pool, accommodating a maximum of two people. 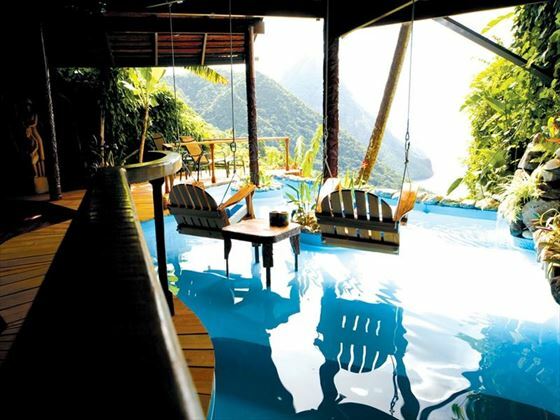 Rainbow Suite with plunge pool – sitting high over the rainforest, these open air suites offer spectacular views of the Pitons and the ocean, accommodating a maximum of two people. Hilltop Dream Suite with plunge pool – truly luxurious, these suites accommodate two people in exceptional comfort offering breathtaking panoramic views with an open air bedroom featuring a king-size four poster bed plus a heated plunge pool. Heritage Suite with heated pool – set across two levels, Heritage Suites offer an open air living room and separate dining area in addition to spacious master bedroom with four poster king-size bed and heated swimming pool. 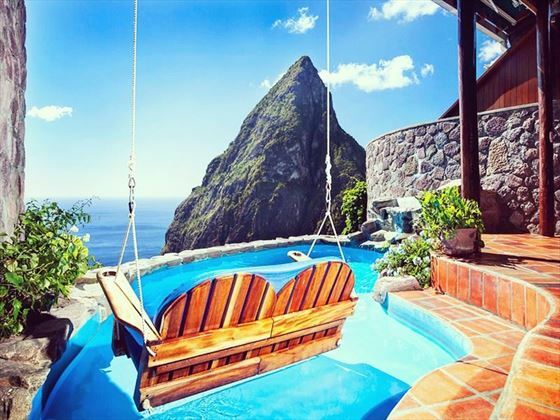 The Suites at Paradise Ridge with heated pool – large suites made in authentic St Lucian style with local materials and offering jaw-dropping views of the Pitons and the Caribbean Sea. Each suite has a swimming pool 1,000ft above the ocean and come with an open-air bedroom featuring a four poster king-size bed.